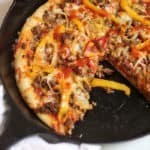 Classic Taco Pizza combines homemade pizza dough with jarred taco sauce, fresh veggies, taco meat, and two kinds of cheese. Unbelievable tasty, and perfect for pizza night! Some of you know that my hubby and I are high school sweethearts. We met in the 3rd grade, when his family moved to town, and went to the same private Catholic school through high school. We had secret crushes on each other on and off during our childhood, and then we started dating after Mike got his license at 16. So sweet, huh? He must have really liked me, because I was sporting two black eyes on our first date, after colliding with my friend’s elbow during basketball practice. So what’s all this have to do with pizza? Mike and I ate Godfather’s taco pizza almost EVERY weekend during our high school dating years. You see, our small town didn’t have many options, but we didn’t care because we loved Godfather’s. So much. Do you want to prep ahead? Make homemade dough, and keep individual pizza portions in the freezer (or it stays ok in the refrigerator for a day). 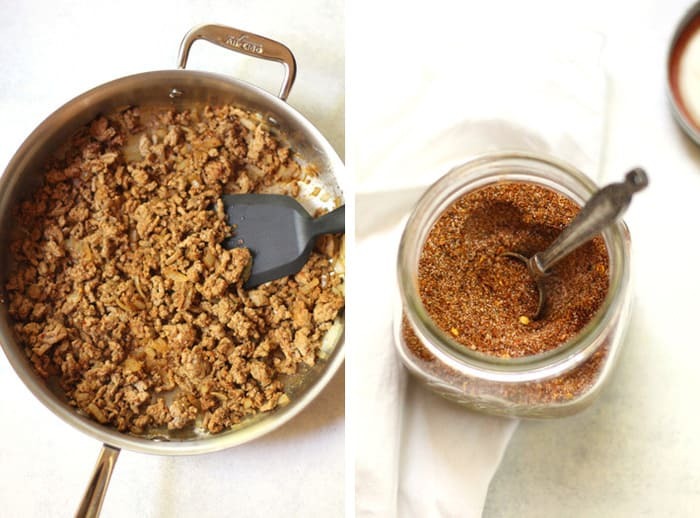 Keep a jar of taco seasoning handy in your pantry. Brown the ground beef up ahead of time (and you can keep this in the freezer as well). I’m still loving my cast iron skillets. I’ve got a bunch of them, and while I used to use them exclusively for pizza nights, now I use them almost daily for almost anything. Frittata, skillet cookie, cobbler, breakfast hash, black-eyed pea dip, migas, and so on. if you are searching for one. NOTE on dough: If making homemade pizza dough, follow my steps on that recipe. 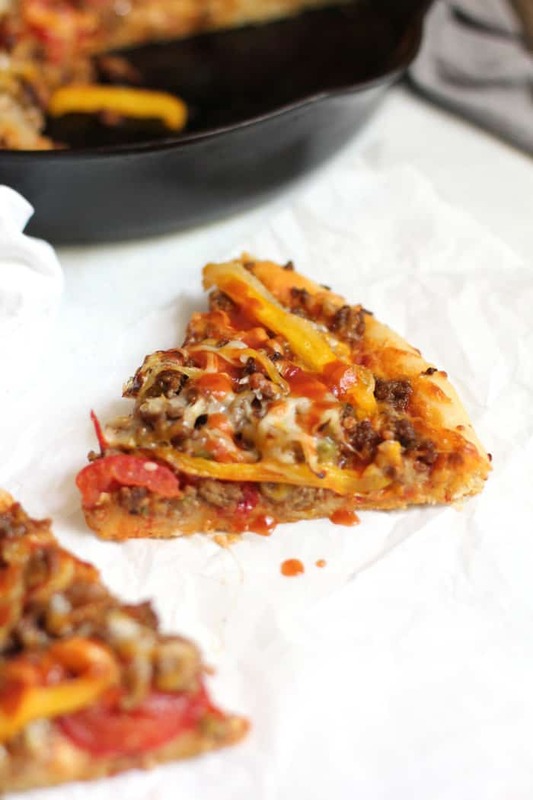 You can also freeze pizza sections and use one for this recipe. Or if preferred, use store bought dough. Prepare taco meat. Brown ground beef in medium skillet, on medium high heat. When beef is cooked through, add diced jalapeño and taco seasoning. Cook for another 5 minutes, and set aside. Using same skillet, sauté the peppers and onions in a bit of olive oil. Set aside. Preheat oven to 450 degrees. 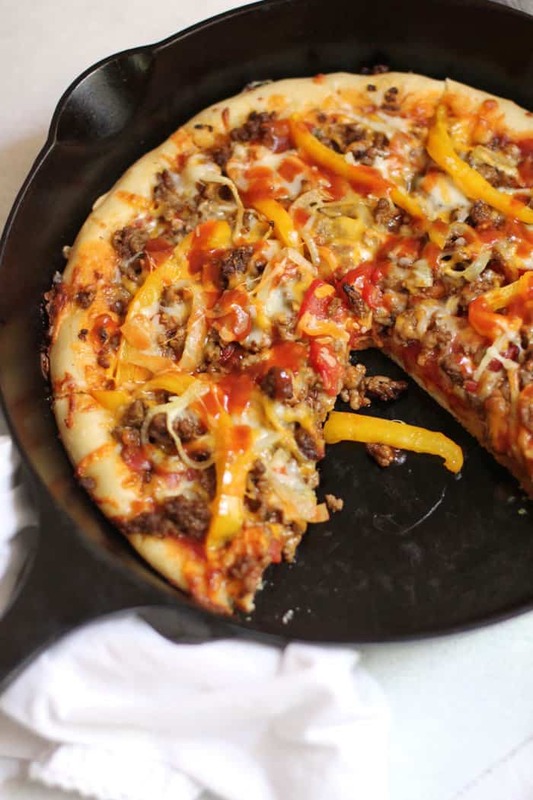 Prepare skillet (or pizza pan) with baking spray. Spread dough out, using your fingers to push it to the edges. Add toppings. Spoon taco sauce on top of dough. 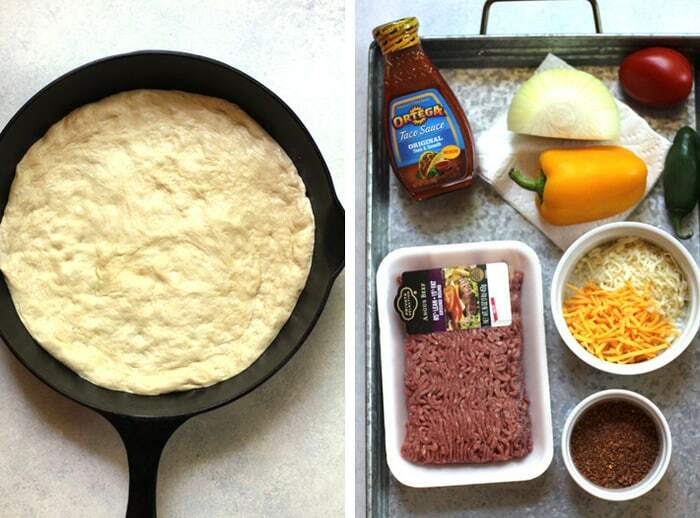 Add prepared taco meat. Then add sliced tomatoes, peppers, and onions. Top with cheese. Bake for 15 - 18 minutes, or until crust is golden brown on the bottom and cheese is melted. Serve with extra taco sauce. Enjoy! 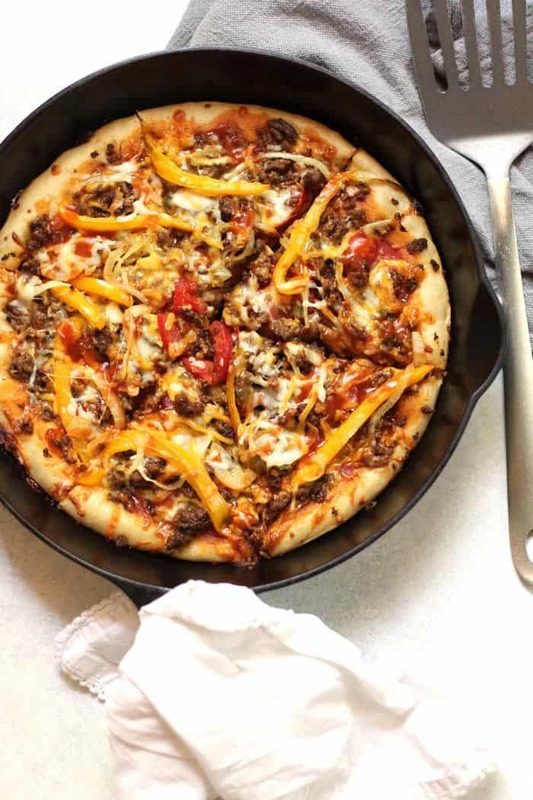 You can prep in advance and have individual pizza dough (freezes well), homemade taco seasoning, and browned ground beef all handy and ready to go. Omit the jalapeño if you don't like any spiciness. The crust should get golden brown and slightly crunchy on the bottom. Add shredded lettuce to the top of the pizza to serve. I married my high school sweetheart too! I love your post and the recipe! 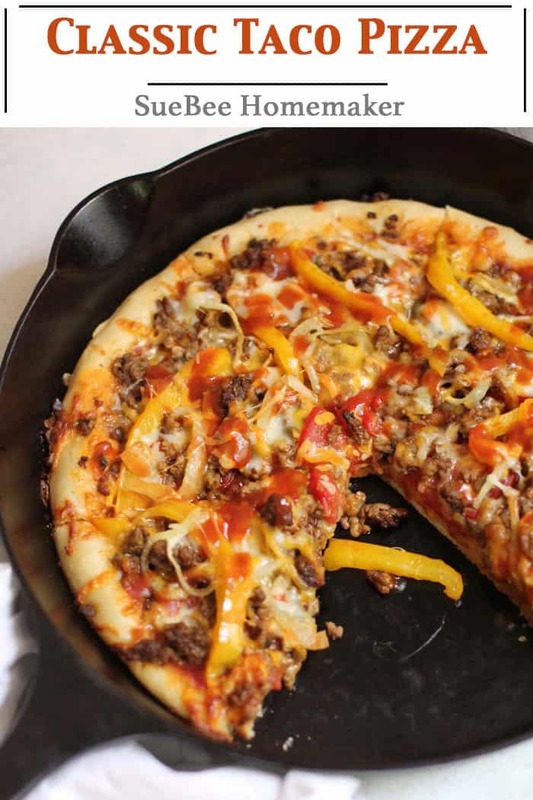 I love pizza and this is my favorite recipe. So much fun when the family is all together! The cast iron skillet suggestion is key though!